Wyoming's Great Seal was adopted by the Second Legislature in 1893 and revised by the Sixteenth Legislature in 1921. The Secretary of State is the Custodian of the Great Seal. The signature of the Governor, the certifying signature of the Secretary of State, and the impression of the Great Seal represent the authority and sovereignty of the State of Wyoming. 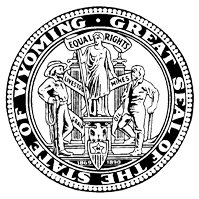 The two dates on the Great Seal, 1869 and 1890, commemorate the organization of the territorial government and Wyoming's admission into the Union. The woman in the center holds a banner proclaiming "Equal Rights," symbolizing Wyoming as the first government to grant equal civil and political rights to women. The male figures typify the livestock and mining industries of the state. Upon a five-pointed star the number "44" appears, being the number of admission into the Union. On top of the pillars rest lamps from which burn the Light of Knowledge. Scrolls encircling the two pillars bear the words "Oil," "Mines," "Livestock" and "Grain," four of Wyoming's major industries. This year, beginning on February 8, 2018, the Office of the Secretary of State marks the 125th Anniversary of the Great Seal of the State of Wyoming. As the custodian of the Great Seal, this Office has planned several events to commemorate this important year in Wyoming's History. If you would like additional information regarding the Great Seal of Wyoming, please visit our digital archive.